NCERT Solutions for Class 10 Math Chapter 10 Circles are provided here with simple step-by-step explanations. These solutions for Circles are extremely popular among class 10 students for Math Circles Solutions come handy for quickly completing your homework and preparing for exams. 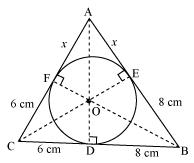 All questions and answers from the NCERT Book of class 10 Math Chapter 10 are provided here for you for free. You will also love the ad-free experience on Meritnation’s NCERT Solutions. All NCERT Solutions for class 10 Math are prepared by experts and are 100% accurate. 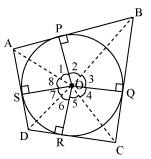 (i)	A tangent to a circle intersects it in _______ point (s). (ii)	A line intersecting a circle in two points is called a __________. 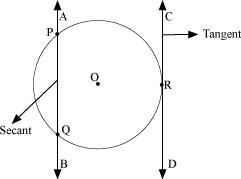 (iii)	A circle can have __________ parallel tangents at the most. 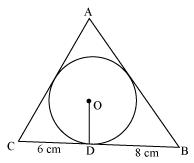 (iv)	The common point of a tangent to a circle and the circle is called ____.